UNLOCKED PROTRADER: Trade Modern, Don’t Own It! The word “eternal” is defined as “lasting or existing forever; without end or beginning.” In Magic, the word is used to describe non-rotating formats, as they essentially last forever. And we all know what non-rotating formats mean in the financial world: stability in prices. While Vintage and Legacy prices remain largely predictable—especially the gradual increase of staples on the reserved list—the fledgling Modern format seems to go through constant flux. Prices skyrocket on some cards while other cards tank in value due to an array of variables (though none involve rotation). Bannings and unbannings act as forceful shake-ups to the metagame, newly printed cards can strengthen one deck or hinder another dramatically, and one could even argue that the format isn’t yet solved. 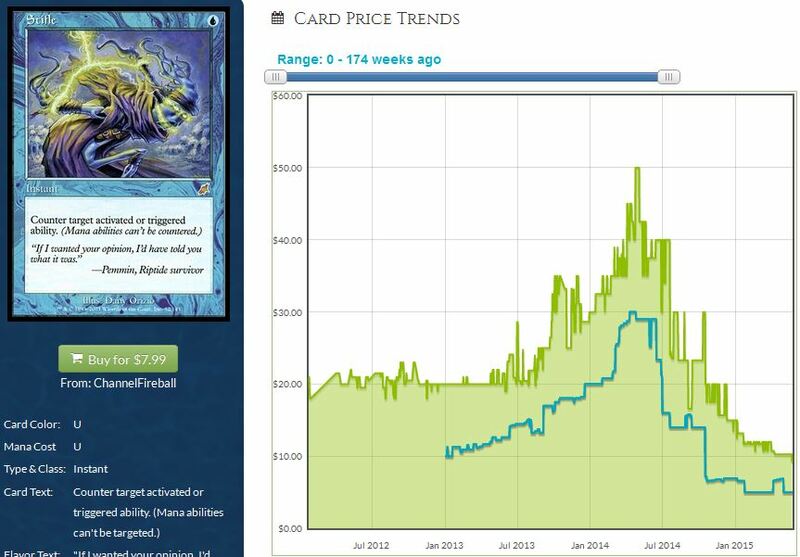 But all of these variables pale in comparison to the highest form of price manipulation: reprints! 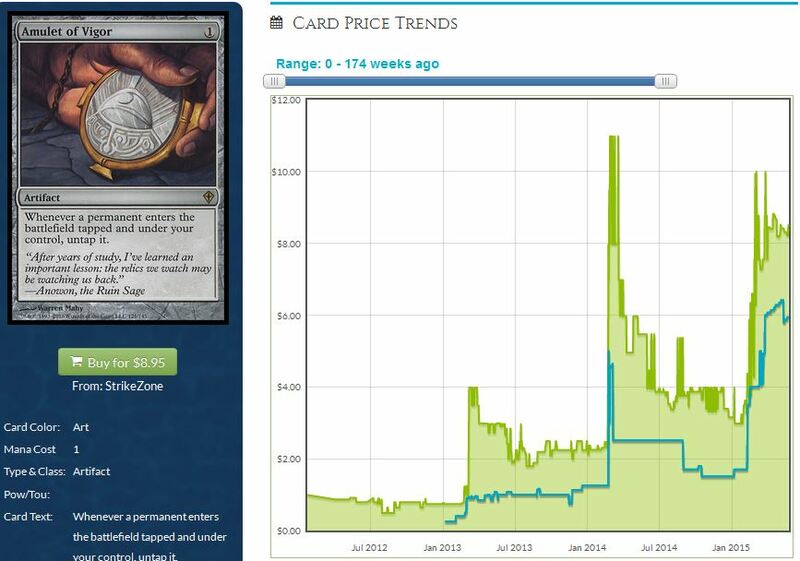 Often times, a card’s reprinting is almost like a death sentence, killing years of potential price appreciation. One look at the chart for Thoughtseize is all it takes to convey the dire consequence of a reprint. 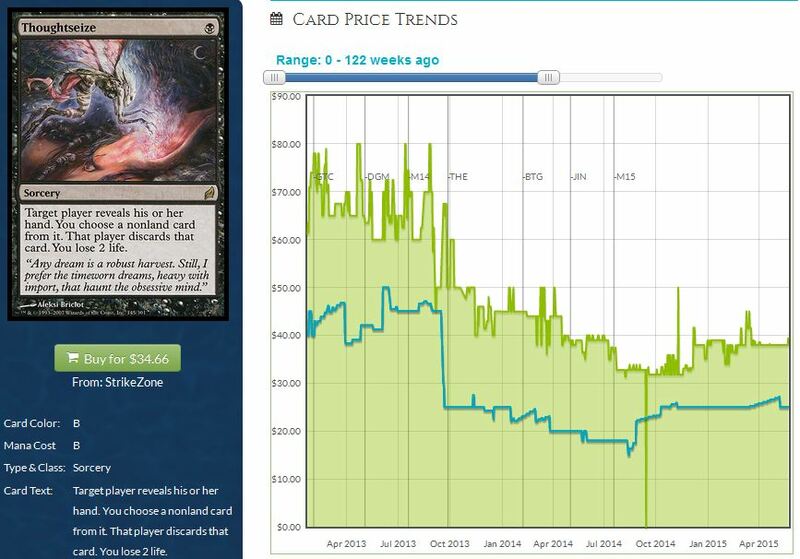 The black sorcery from Lorwyn peaked near $80 in value, but now sells for under $40. The more than 50-percent drop is also reflected in the buylist price (the blue line on the chart above), which dropped from $50 to under $20 for a brief moment before recovering to around $25. Of course, reprints don’t only happen to Modern cards. During the release of Conspiracy, we saw a handful of Legacy staples get absolutely destroyed value-wise due to reprinting. Examples include Exploration and Misdirection, though Stifle still sticks out the most to me: I remember buylisting my copies a few years ago for around $15, then regretting that I sold out early, as Stifle peaked at around $50. But then it got absolutely obliterated by its reprint: it’s now valued under $10! But while the Legacy format can also receive the reprint treatment now and again, it seems like Modern is taking the largest beating. After all, Wizards of the Coast has released two entire sets dedicated to Modern reprints. Not only that, but I suspect these sets are likely to become a recurring thing based on the year being listed in Modern Masters 2015, meaning we haven’t seen the last of Modern reprints. Far from it. This means that despite the hundreds of reprints we’ve received since Modern’s inception, we can expect to see many more. As the format ages, Wizards of the Coast will have a larger and larger pool to choose from for reprinting. For example, in a hypothetical Modern Masters 2017, we can expect to see cards from Innistrad block like Snapcaster Mage and Cavern of Souls. Then in Modern Masters 2019, we’ll get reprints of Abrupt Decay and shock lands. The cycle could continue indefinitely—after all, Modern is an “eternal” format, right? While technically Modern fits the eternal format definition, I’d argue that prices are more inclined to behave like those of Standard than Legacy going forward. In a way, a recurring cycle of Modern Masters is equivalent to Standard rotation. Both phenomena have a profound impact on card prices by applying downward pressure. Then over the long term, the true powerhouse staples may slowly recover with enough demand and player base growth. While Legacy cards may also see reprint to an extent, it’s clear that Wizards of the Coast is prioritizing the reduction of cost of entry to Modern. After all, with the company’s self-inflicted reserve list policy, it can never reprint dual lands. As a result, we are likely to see duals rise over a long enough horizon (despite recent pullback trends…which are the reason I’ve been building my dual land position). This type of steady, predictable price inflation can not be a characteristic of Modern staples. Constant threat of reprints severely hinders the potential for appreciation over time. The looming fear that a card’s value will be cut in half is too severe. Because of this ongoing threat, I anticipate there will be a number of long-term effects providing everlasting (eternal?) headwinds to Modern card prices. Below I present three results stemming from the reprint epidemic in Modern beyond the acute price drops. You don’t have to be a fan of CNBC personality Jim Cramer to appreciate his sentiment on Apple stock over the past few years: “Own it. 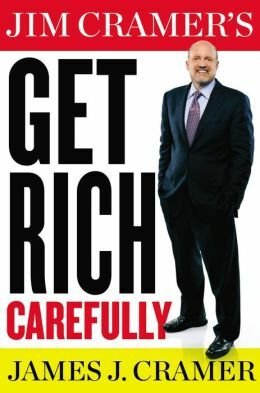 Don’t trade it.” His point is that while Apple’s stock is prone to sizable fluctuations, the long term prospects of the world’s largest company is overall positive. Therefore, he advocates that you don’t try to buy and sell the stock constantly, but rather sit tight and enjoy the upward ride. None of this is accurate for any Modern staples. In the world of Modern, you need to be a frequent trader and not an investor. You can’t become complacent with a single Modern card because you just never know when a reprint may occur. You also never know when a card will be banned, for that matter. The banning of Birthing Pod may have been the right call, and it certainly shook up the format in time for the Pro Tour. But the move cost me over $100 when all the dust settled. Pod dropped, and so did the likes of Reveillark, Ranger of Eos (less severely), Orzhov Pontiff, and worst of all, Chord of Calling. Even though we knew Snapcaster Mage and Inkmoth Nexus were strong buys once it was confirmed they were out of MM2015, staples like these really aren’t good “investments”—they’re good trades. They are good to acquire over the course of a few months. But there’s not a single Modern card I can advocate investing in for years. Once again, I turn to Twitter for an inspiring dialogue that best illustrates this point. The debate at hand was whether or not Modern Masters 2015 will provide the same increase in Modern interest that the original MMA sparked. The jury is still out on this one, but I want to highlight the viewpoint I communicated: now that Modern has been around for years, most players already have their decks. 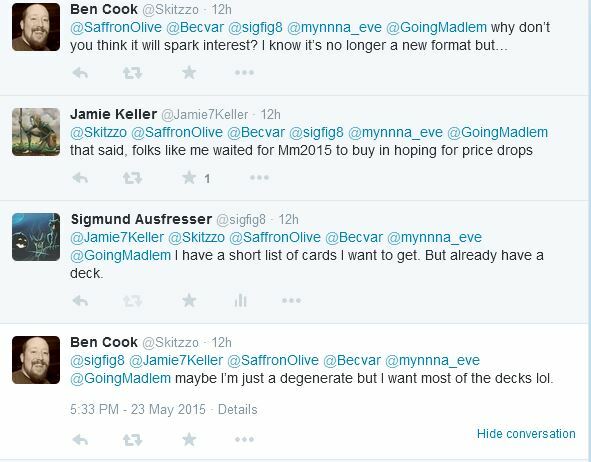 And while many players are in Jamie’s boat, acting opportunistically on MM2015-incited price drops, the reality is most players already interested in Modern have most of the cards they need. Only the newest of new Modern players will be looking to acquire three more Tarmogoyfs after opening one in a pack. Ben shared his desire to build many Modern decks. While he has my utmost respect for pursuing this quest, I am left questioning the financial sense it makes to do so. If you’re jamming Modern on a regular basis, I could see the value of owning multiple decks to adjust to metagames. But having a number of Modern decks built is also a major liability because you are subjecting yourself to so much potential downside due to reprints. When I was playing Legacy on a weekly basis, I was fortunate enough to trade towards cards required to build multiple archetypes. Like Ben, I enjoyed the versatility of having multiple decks at my disposal. But while I sat on a sizable Legacy collection, I never feared a sudden collapse in my cards’ values. The Legacy format was stable enough to give me confidence my assets would hold their current prices or even appreciate. So if I wasn’t enjoying one particular deck enough, I at least knew I could make profit over time regardless. This is not the case with Modern. Holding many decks—or holding a large Modern portfolio for that matter—for an extended period of time is like asking for punishment. It may not be as bad as buying multiple cars from a value standpoint, but it’s probably close. If enough people have this sentiment as me, it could mean less demand for Modern cards from players going forward. Modern players could potentially build the decks they want and be content to stop acquiring. The opportunity cost of sitting on unused Modern merchandise is simply too great. This last consequence is probably a corollary of the first two, but I want to call it out separately in order to emphasize it. If speculators are focused on trading (not investing) Modern staples, and players are less inclined to build many decks, then you’ll have an environment where Modern cards are much more liquid and volatile. If I pick up an extra dual land or Lion’s Eye Diamond, I may be inclined to sit on it for a while as an investment. The same goes for reserve list EDH staples, like strategic Legends rares. By sitting on copies and not unloading them, players reduce liquidity in the market by removing copies from the economy. But with Modern, it’s different. Modern cards are far more liquid because players will frequently be looking to get rid of certain cards. Open a Vendilion Clique in an MM2015 pack, but playing Jund in Modern? Throw that Clique on TCGplayer for a quick sale! Have all the fetches you need already? Throw extras in your trade binder—they are highly liquid and should be easy to trade toward the cards you do need. One weekend of Jund dominance could send Liliana of the Veil to new all-time highs. Sudden proliferation of Affinity decks could mean sizable gains for holders of Creeping Corrosion or Stony Silence. As mentioned before, all of these rapid price moves lend themselves toward trading and not investing, which is why we’re likely to see massive volatility in the Modern market continue. In short, Modern speculation won’t be for the faint-of-heart nor for those short on time. Significant profits can be had dealing in Modern, but constant attention to the metagame and likely reprints is required. Whereas you could purchase a Tabernacle at Pendrell Vale and sit on it for years to make money, the same strategy simply doesn’t work with Modern staples. For one, you subject yourself to severe reprint risk. Additionally, you may miss a prime opportunity to sell at a peak when a given Modern staple may be in higher demand due to a metagame shift. Lastly, be careful building many Modern decks for personal use. While it is certainly fun to switch up strategies from week to week, you need to consider the possible ramifications of sitting on so much Modern stock for long periods of time. In other eternal formats like Legacy, sitting on extra staples is often a boon for your wallet. 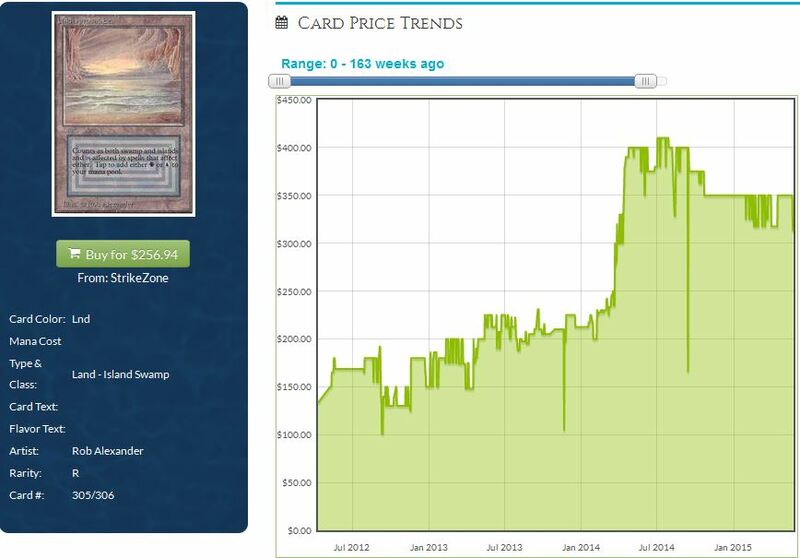 But with Modern, it could mean riding many downward trajectories in card prices, such as the one below. If you’re not using the cards often, think before you sit on many cards for too long. Weigh the opportunity cost of holding through potential reprints alongside how much you’re enjoying these cards. Personally, I maintain just one Modern deck—I concede the fact that some of my cards may drop in price due to reprinting because I like having a deck to play with. But because I don’t play frequently, I can’t justify suffering this financial pain across multiple decks. The losses are just too great. And with the likelihood of many reprints to come in the future, my recommendation to trade Modern cards and not own them is more important than ever. If you’re up for some good Modern pick-ups to flip in a few months, here are some worthwhile considerations. Just don’t hold these for too long—you never know when they’ll get reprinted or fall out of favor in Modern. Arcbound Ravager dodged MM2015 reprint. 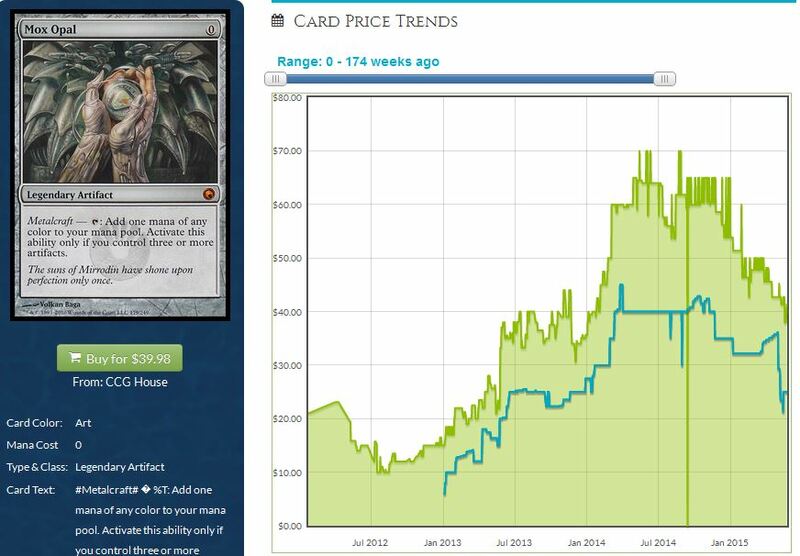 After getting the reprint treatment in MMA, the artifact creature has recovered in price completely. Now Star City Games has just two total copies in stock, and both are SP and from Darksteel. NM copies are just over $20 and are completely sold out, and prices should go higher if Affinity remains a popular strategy in Modern. I like Hive Mind as a pickup in trade. The card was printed only once, in Magic 2010. SCG has just two SP and three MP copies in stock, and they’re sold out of NM copies at $5.05. While Amulet Bloom’s popularity may wax and wane, the raw power of this enchantment should help buoy its price for the foreseeable future. Mutagenic Growth’s reprint in MM2015 will absolutely destroy this common’s value. SCG has 77 NM copies of the MM2015 version in stock for $0.49 and 97 New Phyrexia copies at the same price. Vines of Vastwood has a similar story. Might of Old Krosa, on the other hand, dodged reprint yet again. Star City Games has plenty in stock, but we’re nearing $10 uncommon territory. Foils are sold out, however, with a price tag of $14.99. Expect this price to rise very soon. A lot of valid points were made here and I think sitting on Modern staples will hurt you. I have a playset of Snapcaster’s for example, and there is no way I’m sitting on these until 30 years from now. I know it will be reprinted in the next MM so my mind is set on selling them a month from release no matter what. Will these be an $800 playset? Who knows, but I will take the profit know matter how low or high it is 2 years from now. As for banned Modern cards, such as Deathrite and Dig Through Time. Buy and hold because they’re Legacy staples and they will grow forever without seeing a reprint ( unless they get unbanned). Dig and Deathrite seem like really bad buys. They were both rares in insanely popular sets and are banned in modern. There are just to many copies out there for legacy to have any real impact on their prices. Foils might not be a bad idea but I would stay far far away from regular copies. Dont forget dig is being played in one of the most popular decks in the standard and its still only a $5 card. Thanks for taking the time to comment and for sharing your feedback. The more I think on the subject of Modern, the more eager I am to keep “bets” on Modern to a 3-6 month timeframe MAX. There’s a good chance Snapcaster Mage goes higher in the coming months. But you just never know – this could randomly show up in Origins or other reprint product. The risk is high on expensive, volatile staples. Agree – all this Modern volatility is perfect for short term trading. But investing in Modern seems like an awful prospect. Thanks for commenting! WooHoo!!! That is great news! Sent you a P.M. on the forums. One thing I notice in modern that may be a little concerning is that more sets get added, but none get taken off the back end. There is a set time where modern begins no matter what year it is, so those cards in that bubble will always stay in that bubble. We will never see Tarmagoyf exit modern, so it will always be under the gun and doomed to the fear of perennial reprints. The volatility will always be there. That is my justification for not chasing goyfs. Great build, shadray. Basically just because we get Goyf reprints once or twice doesn’t mean we will never get a reprint again. 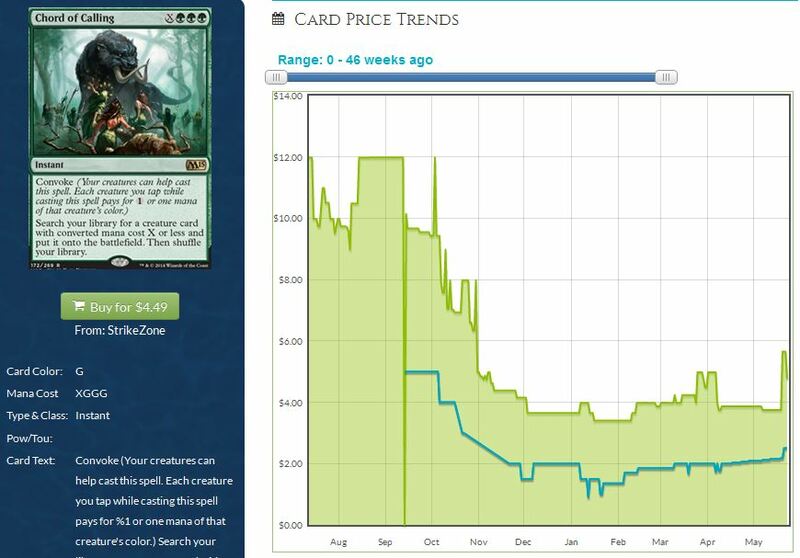 As far as we know, Goyf goes back to $200 in a year and then it shows up in MM2017. I’m not going to touch Modern speculation for the most part, unless it’s on a short term horizon and I have an exit strategy in mind. All I’m hearing is the speculation side of it. What about just the playset for a collection. You advise in not keeping those around? It may depend on the enjoyment you get out of collecting. If you like having full sets available for potential use, then you may have to evaluate the “cost” of holding such cards through potential reprints against the benefits of having them on hand. I suppose if you’re diverse enough in your holdings, things could balance out decently. 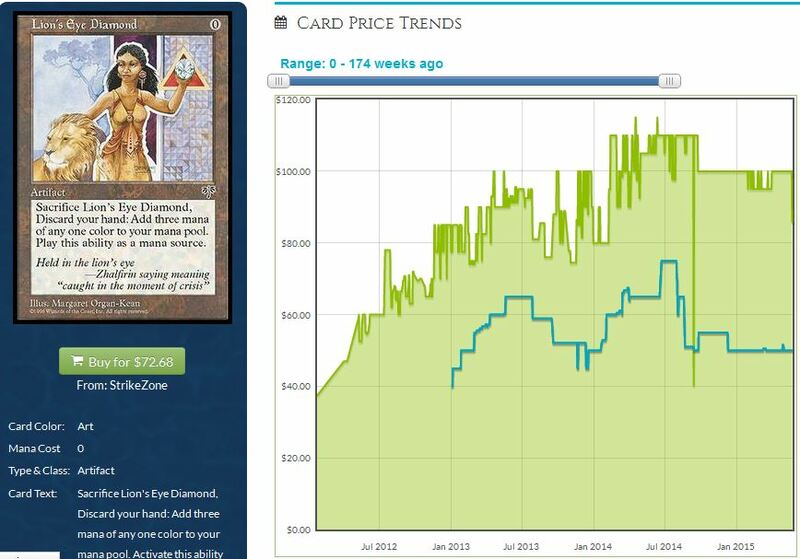 Some cards will actually INCREASE in price while reprints push other card prices downward (see: Blood Moon). There is something to be said about not having to sell and re-buy cards over and over again, too. Time is also very valuable. So if you wanted to have a set of, say Noble Hierarchs, on hand for potential use, I won’t fault you. But if your set was rotting in a binder and you didn’t really care about them, then moving them in advance of MM2015 would have probably been the best play money-wise. Time-wise, however, it’s really up to you. I personally kept my Leyline of Sanctities, Primeval Titans, and Spellskite because they’re all in my Modern deck and I wanted to have the deck complete for my trip to Vegas. But cards NOT in my Modern deck were all on the chopping block!